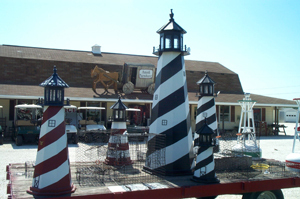 For over 40 years, travelers and local residents on the Eastern Shore of Maryland have been stopping in to visit one of Talbot County’s most familiar landmarks right here at Pop’s Market. Located just below Easton along Rt. 50 in Trappe MD, this popular family owned and operated store has grown over the years to become one of the Mid-shore’s most well known marketplaces and distributors of fine quality to Amish built sheds, large storage sheds, mini barns & gazebos in all sorts of sizes, shapes and styles, plus new trailers, a great selection of new and used farm equipment, golf carts & club cars and much, much more! Millions of vacationers recognize Pop's Market as they pass by each year and have been watching it grow from a small little produce stand to a marketplace of almost gigantic proportions. 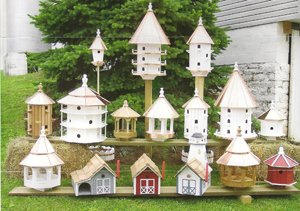 Pop’s Market now has over 100,000 square feet of indoor and outdoor space where they display everything from copper topped birdhouses and miniature wooden lighthouses to Amish built wood sheds, farm equipment, trailers, golf carts and other portable buildings in all sorts of sizes, shapes and styles. A Marketplace Unlike Any Other! Pop’s Market is actually two stores in one. We have an Indoor Store where you can browse to your heart’s content all day - whether you are shopping for fine quality Amish made wood furniture or just looking for something to add sparkle to your home or place of business. Someone from over three generations of the Schwaninger family will be happy to assist you in finding just what you need - and if we don’t have it in the store, we will custom order it for you if it is available. 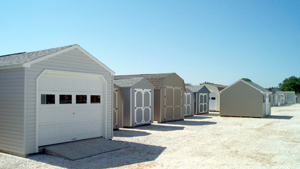 And of course, if we don’t have exactly what you are looking for here on our lot, we will custom order it for you and even have it delivered directly to your home or place of business... and often at no additional charge. We Make Every Visit Memorable! As one of the Talbot County’s most highly visible landmarks, our family works extra hard to make you feel right at home from the minute you stop in until we wave you goodbye. We feel that we have an obligation to provide every customer and visitor with the kind of Eastern Shore hospitality that has helped turn our small family run business into such a popular destination spot for both local residents and the many visitors who come from all over the world. We take a lot of pride in what we do and have been adding new products and services every year as we have grown. 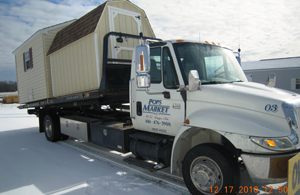 We will be happy to help you remove your old shed or outbuilding when making delivery on any of our wood or vinyl outdoor buildings to your property. We can also pick up and deliver mechanical or farm equipment in need of repair or restoration. We provide delivery to many areas on the Eastern Shore of MD including: Trappe, Easton, Cambridge, St. Michaels, Kent Island, Oxford, Wye Mills, Wye Oak, Royal Oak, Denton, Chestertown, Centreville, Rock Hall, Queenstown, Grasonville, Stevensville, Vienna, Linkwood, Trapp, Preston, Ridgely, Caroline County, Queen Annes County, Kent County, Dorchester County, Sussex County, Delaware lower shore, Hurlock, Hebron, Salisbury, Ocean City, Worcester County, Wicomico County, Somerset County, MD and more. Stop in, Call or Email us today for details. We are proud to service what we sell and we stand by each and every repair on all our new and used products, farm equipment, lawn equipment, tractors, golf carts, & ATV’s. We will even rebuild and restore your older and sometimes antiquated machinery back to better than new condition. Give us a call or stop on in to ask about our complete restoration and repair services. During hunting season bring your geese and duck to Pop's Market for waterfowl picking and processing. Call for details. Check out our Facebook page to see our current specials and great deals on new and used furniture and equipment! Financing is Available! We also accept VISA, MASTERCARD & AMERICAN EXPRESS.